Start your trip on the northeastern shore of Anima Nipissing Lake, at the terminus of the Anima Nipissing access road. Carefully load and trim your canoe if the wind is blowing on-shore. From the landing, you may want to paddle across the lake to see the first of several pictograph sites on Anima Nipissing. Alternately, you can paddle a short distance along the eastern shoreline where you can locate the trail to the historic Brigstocke Fire Tower. Carrying on, you will paddle past Sugarloaf Island. Notice the ‘cave’ – a remnant of mining activity from the early part of the last century. At the south end of Mannajigama Bay, you will portage into Mannajigama Lake. An old logging road interrupts the portage, so we’ll provide you with detailed directions. Mannajigama features two campsites – one that is large, and a very small campsite, suitable for a single tent only. You have two options for leaving Mannajigama. The shortest route is to paddle west and portage into an unnamed lake, and then portage north into Dart’s Bay, which leads directly back into Anima Nipissing. 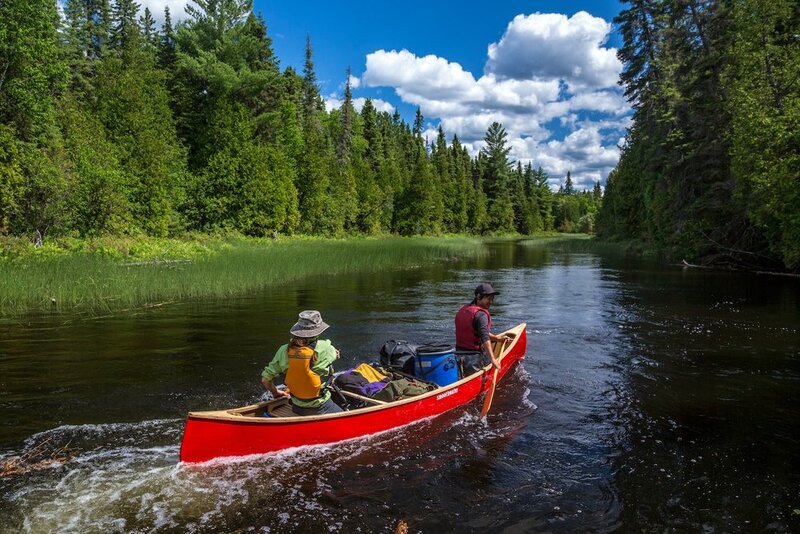 The longer option is to paddle southwest and portage into Snare Lake. From Snare you portage west into Snare Bay, which leads into Anima Nipissing. Two pictograph sites can be visited on the western shore in this vicinity of the lake. Regardless of the route chosen, campsites are plentiful as you paddle north on Anima Nipissing. If the weather is favourable, your paddle through the two narrows on your way back to the landing will be pleasant and uneventful. The effect of inclement weather on the lake can significantly lengthen the time required, so carefully consider that when deciding at what time to break camp. A short distance before the landing is the Twin Islands - a lovely place to stop for lunch and a last swim. The large expanse of flat rock invites a post-meal nap.